*Tips cannot be sold or used for profit. but loving in your delivery. "Stand for something or you will fall for anything." 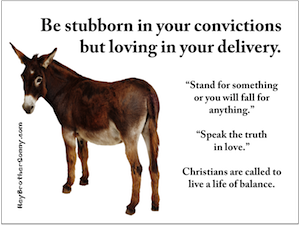 Christians are called to live a life of balance. Be Alert! Our Assignment Is Not Without Risk. "The harvest truly is great, but the laborers are few; therefore pray the Lord of the harvest to send out laborers into His harvest. God your way; behold, I send you out as lambs among wolves." 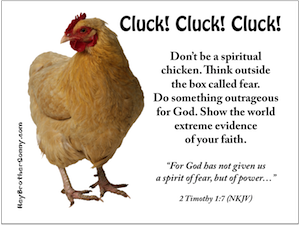 Don't be a spiritual chicken. Think outside the box called fear. Do something outrageous for God. Show the world extreme evidence of your faith. "For God has not given us a spirit of fear, but of power...."
As the old saying goes, "Time is money." Don't cheat your employer out of his fair share of the time for which you are being paid. In fact, Christians should go the extra mile. 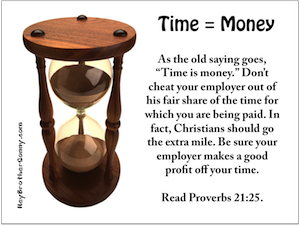 Be sure your employer makes a good profit off your time. 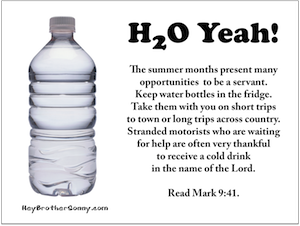 The summer months present many opportunities to be a servant. Keep water bottles in the fridge. Take them with you on short trips to town or long trips across country. Stranded motorists who are waiting for help are often very thankful to receive a cold drink in the name of the Lord. 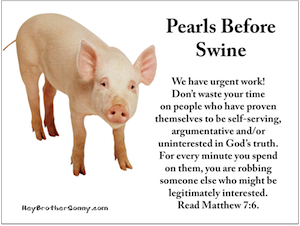 Don't waste your time on people who have proven themselves to be self-serving, argumentative and/or uninterested in God's truth. For every minute you spend on them, you are robbing someone else who might be legitimately interested. 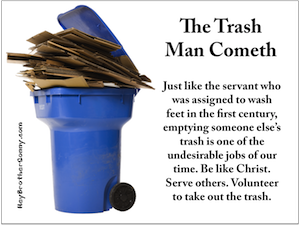 Just like the servant who was assigned to wash feet in the first century, emptying someone else's trash is one of the undesirable jobs of our time. Be like Christ. Serve others. Volunteer to take out the trash. 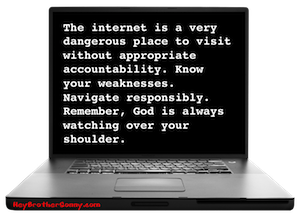 The internet is a very dangerous place to visit without appropriate accountability. Know your weaknesses. Remember, God is always watching over your shoulder. 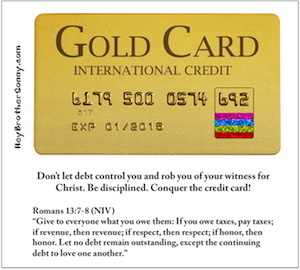 Don't let debt control you and rob you of your witness for Christ. Be disciplined. Conquer the credit card! "Give to everyone what you owe them: If you owe taxes, pay taxes; if revenue, then revenue; if respect, then respect; if honor, then honor. Let no debt remain outstanding, except the continuing debt to love one another." Learn how to spot potential conflict before it ever happens. 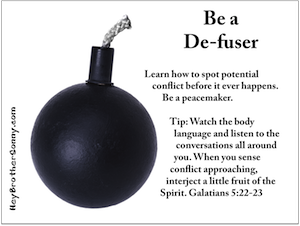 Be a peacemaker. It's the day after Easter. Did the celebration of Resurrection Morning have any last effect in your life? Take time right now to assess the change. 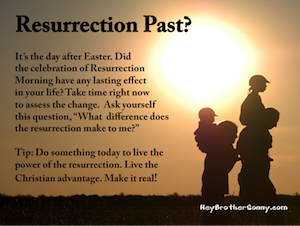 Ask yourself this question, "What difference does the resurrection make to me?" Tip: Do something today to live the power of the resurrection. 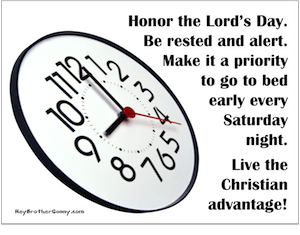 Live the Christian advantage Make it real! Fresh fruit and veggies are just a few months away. 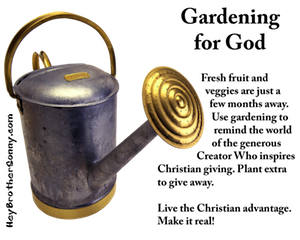 Use gardening to remind the world of the generous Creator Who inspires Christian giving. Plant extra to give away. 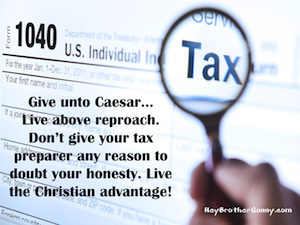 Don't give your tax preparer any reason to doubt your honesty. Make it a priority to go to bed early every Saturday night. Did you ever wish you were rich enough to just give money away? Well maybe you are. Don't spend your change. Collect it and give it to those in need. 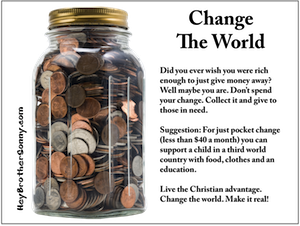 Suggestion: For just pocket change (less than $40 a month) you can support a child in a third world country with food, clothes and an education. Change the world. Make it real! Stained glass windows will break and fade. Houses of worship will age and decay. But the church will always be relevant. 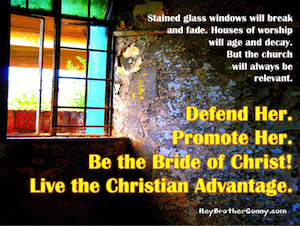 Be the Bride of Christ! Just ten feet of space between us when we pass on the highway. 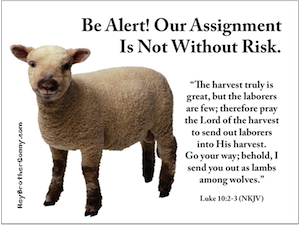 Many are not ready to meet the Lord. 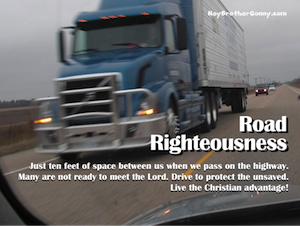 Drive to protect the unsaved. See the positives. Become the positives. 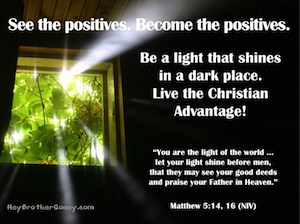 Be a light that shines in a dark place. "You are the light of the world... let your light shine before men, that they may see your good deeds and praise your Father in Heaven." 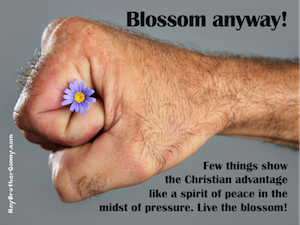 Few things show the Christian advantage like a spirit of peace in the midst of pressure. Live the blossom! Raise the bar. 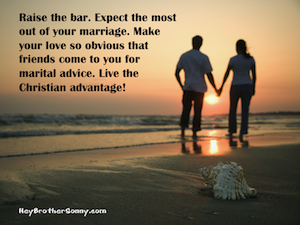 Expect the most out of your marriage. Make your love so obvious that friends come to you for marital advice. 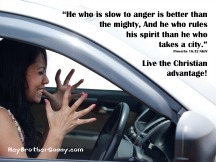 Live the Christian advantage! 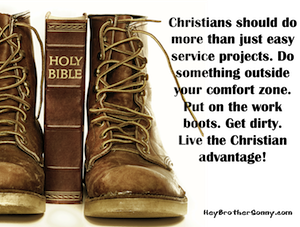 Christians should do more than just easy service projects. Do something outside your comfort zone. Put on the work boots. Get dirty. 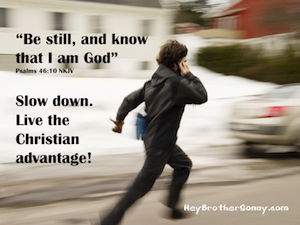 Live the Christian advantage! 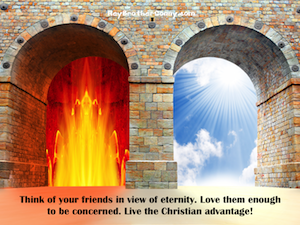 Think of your friends in view of eternity. Love them enough to be concerned. 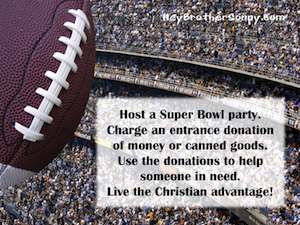 Host a Super Bowl party. of money or canned goods. Use the donations to help someone in need. 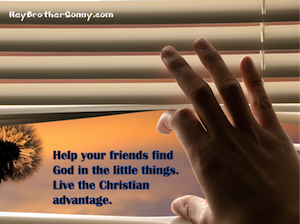 Help your friends find God in the little things. Back to Top of "Tips to Share"